Conscious experience is one of the most difficult and thorny problems in psychological science. Its study has been neglected for many years, either because it was thought to be too difficult, or because the relevant evidence was thought to be poor. Bernard Baars suggests a way to specify empirical constraints on a theory of consciousness by contrasting well-established conscious phenomena – such as stimulus representations known to be attended, perceptual, and informative – with closely comparable unconscious ones – such as stimulus representations known to be preperceptual, unattended, or habituated. Adducing data to show that consciousness is associated with a kind of global workplace in the nervous system, and that several brain structures are known to behave in accordance with his theory, Baars helps to clarify many difficult problems. Consciousness is notoriously difficult to explain. On one hand, there are facts about conscious experience–the way clarinets sound, the way lemonade tastes–that we know subjectively, from the inside. On the other hand, such facts are not readily accommodated in the objective world described by science. How, after all, could the reediness of clarinets or the tartness of lemonade be predicted in advance? Central to Daniel C. Dennett’s attempt to resolve this dilemma is the “heterophenomenological” method, which treats reports of introspection nontraditionally–not as evidence to be used in explaining consciousness, but as data to be explained. Using this method, Dennett argues against the myth of the Cartesian theater–the idea that consciousness can be precisely located in space or in time. To replace the Cartesian theater, he introduces his own multiple drafts model of consciousness, in which the mind is a bubbling congeries of unsupervised parallel processing. 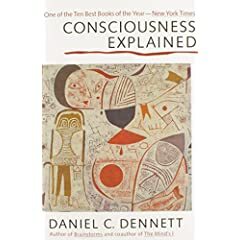 Finally, Dennett tackles the conventional philosophical questions about consciousness, taking issue not only with the traditional answers but also with the traditional methodology by which they were reached. Can a machine really have feelings? Well, even a humble thermostat knows when it gets too hot — and can do something about it. But can a machine think? Does it have a personality? How would you know? In this collection of essays we hear from an international array of computer and brain scientists who are actively working from both the machine and human ends of things to bridge the gap between the mind and the machine. Using entertaining examples of the mind in action, an eminent psychologist explores current scientific theories of the mind and shows how consciousness works like a stage in which thoughts and perceptions are examined by an inner audience. UP. As far as I know there is no official website of this project. CyberChild project is based on a simulation of the brain and body of a very young infant. The main objective of the project is findind the neural correlated of consciousness through computer simulation. The architecture of the simulated Child’s brain is a simplified neural system. The aim of this research is to try and establish a single neural architecture that is capable of doing all the things the brain’s cerebral cortex can do – hearing, seeing, thinking, feeling and moving. This ambitious project is currently closed down due to the lack of funds. The CogAff project is a broad research effort on the principles for designing and explaining architectures for whole intelligent agents. This highly multi-disciplinary project take multiple approached from different scientific fields. One of the goals is understanding consciousness.